It’s been a long time since I’ve done serious scholarly, research-intensive historical research and writing. I’ve spent the last twenty years or so teaching, advising and administering, and writing for a general audience. But I recently had the opportunity to write an article, using some of the new technologies of scholarship. This is a report on what’s changed, and what’s remained the same. 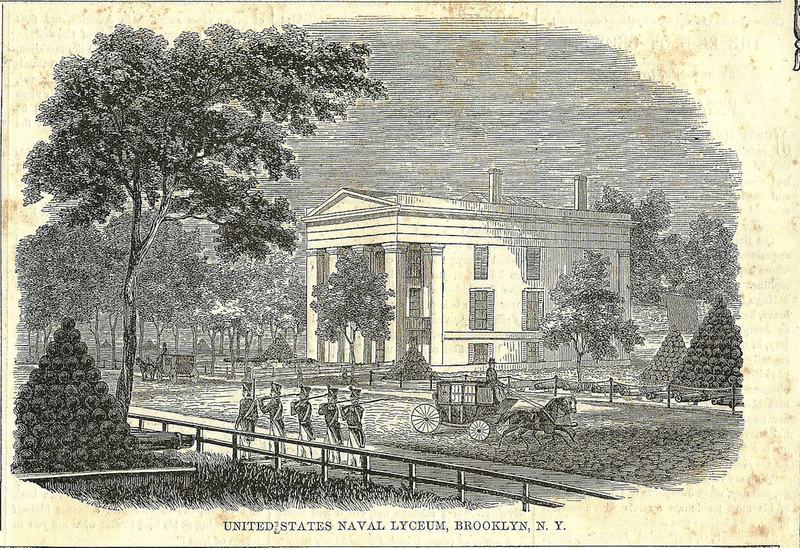 Some background: I had done a lot of research for an exhibition and a talk at the Brooklyn Navy Yard about the United States Navy Lyceum – a library and museum located at the Navy Yard between 1833 and 1889 – and had found it quite fascinating. Back when I did serious scholarship, my field was 19th century American history, so I had a decent, though not completely up to date, sense of the secondary literature. So – why not turn that talk into a scholarly paper? So, I’ve spent the last month or so researching and writing about the way that the naval officers who created the Naval Lyceum used artifacts to represent their ambitions, and the way that the public understood their work. My hope is that the final paper will be a useful contribution to scholarship in the history of museums. Along the way, I kept track of my process, to help me think about a talk I’ll be giving in October. I send students off to write research papers, and so I should be reflexive about my own work, in order to better teach them how to do research. And I was curious to see how new digital tools would change the way I work, and especially if they would change the questions I might ask and answer in my research. The answers I found: Yes, I could ask and answer different questions, especially about museum visitors. Yes, a research plan is still necessary; serendipitous Googling is not enough. No, digital is not enough; it’s still necessary to visit libraries. And a good reminder: research is only the first part of writing a scholarly paper. It’s also about knowing the big picture, puzzling out connections and making sense of relationships, and most of all, creating meaning. That part hasn’t changed. Discovery is perhaps the stage of scholarship that’s seen the largest change. Scholars of 19th century American history have a remarkable amount of material available to them online. Newspapers, books, journals, all of them word-searchable. 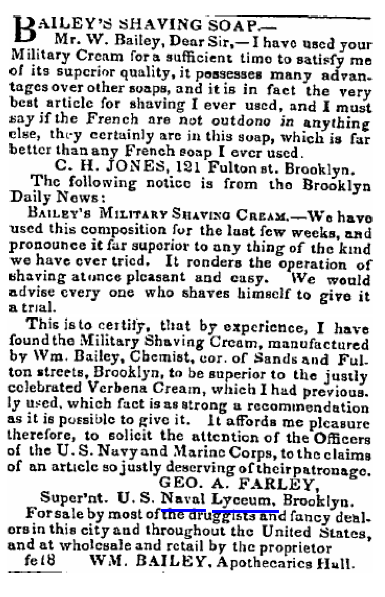 These sources would have been all but impossible to use earlier – I might have read on microfilm the newspapers closest to the Navy Yard, for those days where I knew something had happened. But now it’s easy to simply check out a few hundred newspapers, or a few million books, with a few clicks. This comes with some challenges. One is overabundance. The profusion of low-grade primary sources is distracting – it’s fun to keep looking for more bits and pieces of evidence. There are dozens of newspaper and magazine articles that mention the Naval Lyceum, but perhaps half of them are simply quoting another article, especially in the first half of the century. And a great deal of what they report is not very important. Newspapers on the first draft of history, the saying goes, and a lot gets cut out. I looked at every article – I thought a complete archive might be useful, though looking back, I’m not sure for whom – and found this a problem in writing: too many details. Most of them ended up in my virtual trash. There’s also a new skill required to track down these sources. I started with Google Books because it’s so easy: give it my search term, “naval lyceum,” and it finds an amazing range of materials. But Google Books has a very miscellaneous collection of books and journals available. The American Periodical Series (available through the Brown library) is much more systematic – you know where you’re searching – but not as diverse. And then there are online sources that I didn’t find until late in the process, for example the Brooklyn Eagle (Google doesn’t index it, and it’s only available through the Brooklyn library; I don’t remember how I found it) and the Library of Congress’s Historic American Newspapers project. You have to know where to look. Memo to self: ask a librarian first! That’s still good advice. While tracking down primary sources has changed completely, in ways that can fundamentally change the kind of research that’s possible, tracking down secondary sources seems very familiar. It’s easier to find the articles: thank you, JSTOR. There is an improved interface to America: History and Life (previously a skill proudly learned). I think that a sophisticated user of scholarly data bases can more easily get a 10,000 foot view of the lay of the scholarly literature now. But overall, secondary literature searches seems still open for reinvention. I was surprised by how often my sources sent me to the library. Using online sources, with their easy word search, is so easy that it’s tempting to stick with them. Why look at a book when the dissertation that it’s based on is online, available in seconds, word-searchable? Why not simply look at the articles that an author wrote in the process of working on a book? I admit to using these shortcuts – but also found myself wandering the aisles of the library, mostly sent there by footnotes in articles rather than library catalogs. Writing. A new tool made it possible to keep track of my sources. I’ve used Zotero before, in a desultory way, but had never committed to it at the beginning of the project. As important, I’d never before not cut corners by making footnotes without putting the sources into Zotero first, and then using Zotero to make the note – tempting though it might be to just add the note. Zotero certainly has saved me days of footnote cleaning up, searching for page numbers and bibliographic details. As with finding online sources, I’m sure there’s more that Zotero might do for me. Can I sort books and articles, or notes in them, not by date of publication but by date of material they’re about? I’m sure I could have set up tags to help me know what to look for in the library. The abundance of sources, so much of it in readily cut-and-pastable format, makes possible new ways to write badly. It’s sorely tempting, I found, to cut and paste together descriptions, to let the historical actors, or the newspapers reporting them, speak for themselves. But that’s no substitute for the hard historical work of figuring out what writings and actions mean. It’s odd to wish for fewer sources, but making choices is hard, and the most recent draft of my paper is still too much quotes, too little analysis. It might be that in some fields quick and easy communications between scholars makes a difference in scholarly work. I kept my Twitter followers informed, mostly through entertaining quotes on the nature of museum work in my sources, and posted a bit on my blog. But the topic’s pretty esoteric; not much response there. A paper written over a longer period, with presentations of preliminary work, might get more from the online community. I’ve made my Zotero library public, but again, it’s pretty specialized, and hardly likely to attract a crowd. It does present a new kind of openness: my notes are there, and it should, in theory, make it easy for anyone to check my footnotes, and my sources. Publishing. The next step is to publish this, to turn manuscript into article. The digitalization of all things has changed this in interesting and significant ways. Once, there was only one answer: find the right journal and send it in. New choices mean new challenges. One question: why publish in a journal at all? It’s easy enough simply to put the manuscript onto Scribd and my blog, let the few dozen people who care about it know that it’s there, and move on. Over the course of a few months it will be seen by a few hundred people, which is probably more people than will see it in all but the largest circulation historical journal. True, it won’t be indexed – but it will be Googleable. It won’t get me official credit in my job, but I’m at the stage in my career where that doesn’t matter. And publishing means taking it off the open web. Scholarly publishing has changed enormously in the last decade. Ten years ago I wouldn’t have thought to read the fine print on rights to articles published in journals. Now, because there’s a choice, we know to do that. And it does seem that it really is a choice, either freely open, or published and closed. I can post a draft online, but not the final version; the publishers want to sell that through their website. I understand their economics, and I appreciate the value-added that their editing and vetting can provide, but as a public historian, I don’t like the end result. No answer to this question here; it’s a conundrum that the world of scholarly communications needs to work out. And it will certainly all look very different in another decade. Great post. Can’t improve on any of the points made, and have had pretty much the same experiences.